Been busy as usual, but thought I would show you the new addition to my work space. 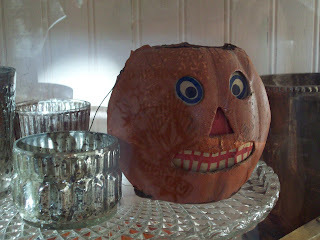 By now most of you know Jennifer Grey www.theoldpaintedcottage.com She is a friend, and neighbor of mine. 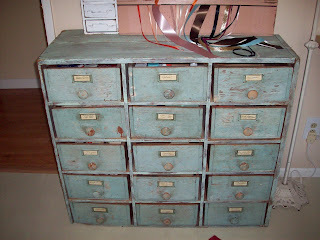 She had this wonderful old file/drawer/whatever you want it to be for sale. She said it had my name on it, and she was right. It fit perfectly in my new space. 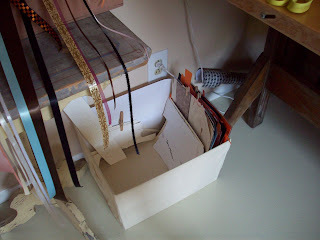 I organized all of my items that I need on a daily basis, in order to make my art. So thanks Jen, I love it!!! 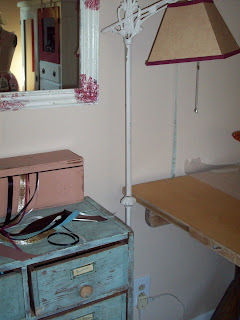 I also purchased this new/old library lamp from my friend Karen. She had it for sale this past Sunday at the Ventura Flea Market. Some of my works in progress. We are having a heatwave!! It was in the 90's today. Not very Fall like. It's almost Friday again. Another busy week. 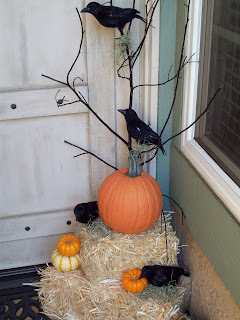 Thought you might like some Halloween views around my house. 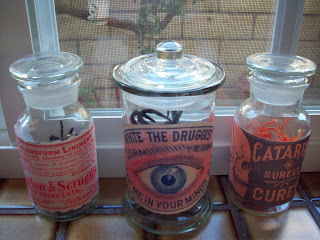 I just made labels for these jars. 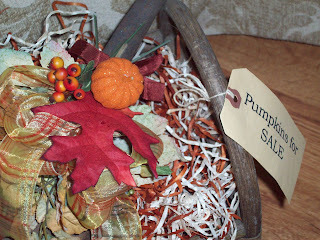 I found 2 of the labels online, and the orange one on the right is from Karen the Graphics Fairy. I got the jars on a super clearance at Michael's. 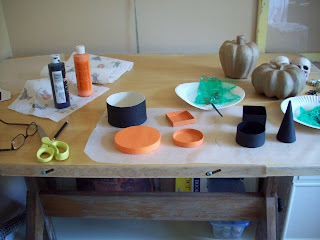 Made the labels, glued them on, and filled the jars with Halloween spiders. A nice addition to the kitchen, don't you think? 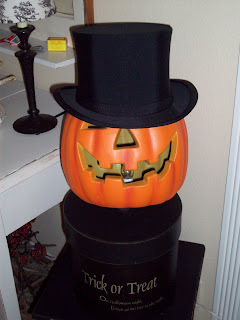 I just got this old top hat on Ebay!! It is in perfect condition. A cute glittery skull. 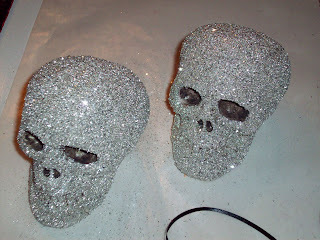 Skulls are much prettier with glitter. 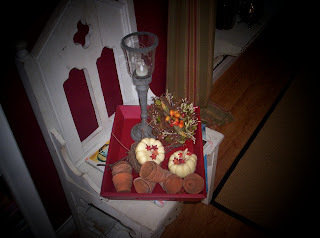 A little vignette on my front porch. 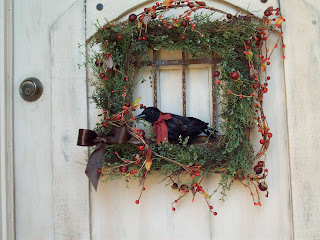 One of the ravens made it to the wreath. I hope you enjoyed that little tour. As some of you already know, I have been making art pieces for shops and individuals. I was working mostly in my kitchen. 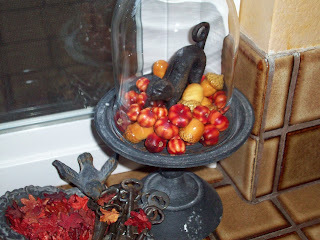 On my kitchen counter, and table. I decided that I needed a better work area. 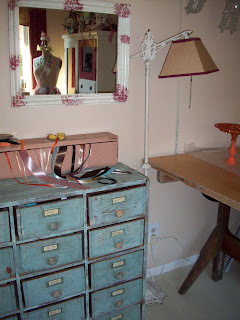 I was in search of a rustic table for my office/studio. I didn't have to look too long. 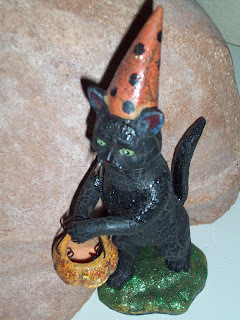 On Saturday morning my daughter Amanda and I went to some garage sales. We came upon this old, rather large drafting table. 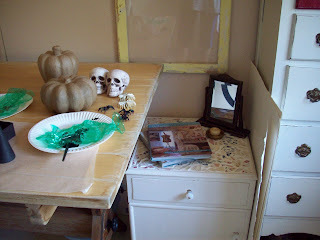 I thought it looked like the perfect work surface for my space. 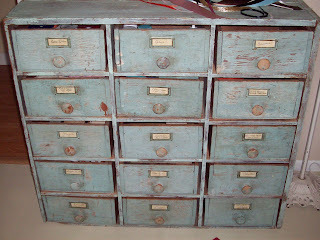 It is old and rustic, so I can spill paint, glue, glitter, etc. and it won't even matter. The lady at the sale had it marked for $50. I got it for $40, Yay!! We had to call my husband to come and pick it up, as it would not fit in Amanda's car. He came right over and got it for me. Thanks honey!! I spent yesterday setting up my space. I had to get rid of a small easy chair I had in the corner of my room. I wasn't really even using it. It sort of was my catch all for stuff. I put it on Craigslist for free, and within 15 minutes it was gone. I started using my new table today, as you can see. It is working out perfectly. At the end of the day, I don't need to clean up the mess in the kitchen. 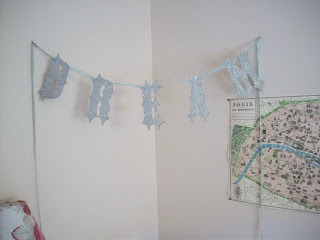 I hung my dream sign that I got from Wren's Cottage across my work area, along with a map of Paris. 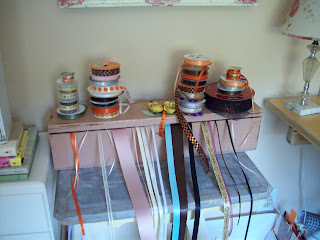 My ribbon is multiplying daily. Another little view. I also got this cute canvas storage bin at Target. It is holding all of my misc. papers. 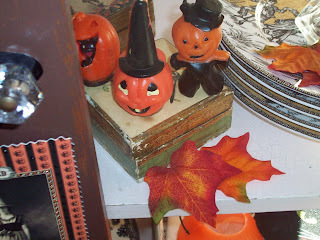 I am still working on some Halloween orders, but soon I think it will turn into Christmas Central!! Hope you all have a Happy start of Fall weekend!! Sorry I haven't been around to visit all of you in the last few days. 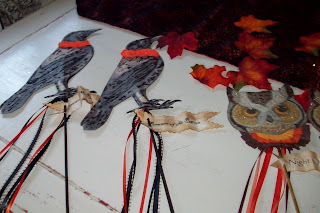 I have been busy working on these Halloween goodies. Remember my headless latte lady from the previous post? 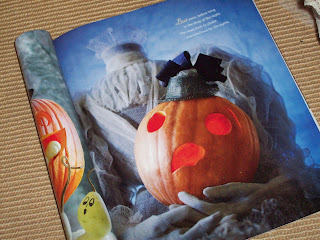 Here is the picture in the Hallmark magazine. She is pretty spooky at night. I hadn't tried a project like this one before. There is one more I want to try in this issue as well. It's a Cinderella coach. We shall see what happens with that one. Have a great week! 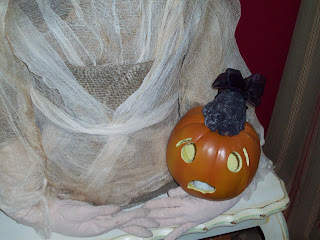 I will be extremely busy this week creating some Halloween items for an order I received. I hope I can get around to visit, but if I don't get a chance, I will be thinking of you all. 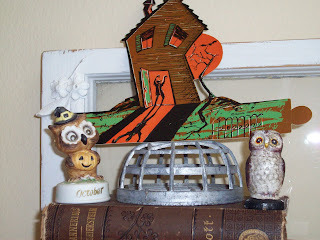 Here is what I am working on for one of my Halloween decorations. 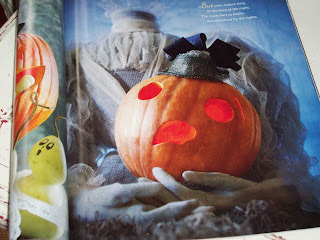 I saw this in the new Hallmark Magazine for Halloween. 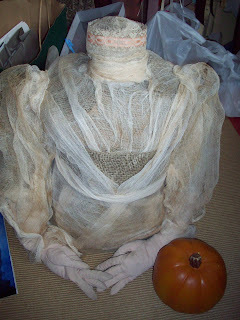 This really cool headless lady. So of course I have to try to make one. 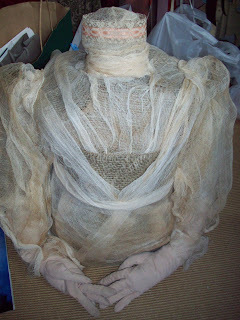 This is her so far, considering they don't really give you many directions. 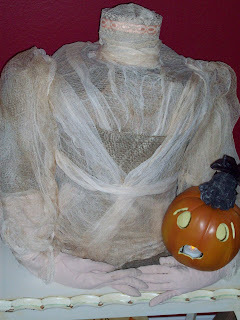 I made her body with paper bags. I got cheese cloth and dyed it with coffee. She smells like a latte. Got some old gloves at an antique mall. 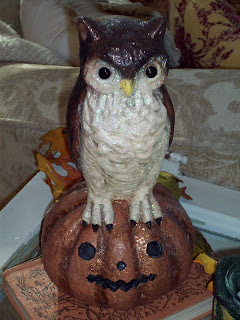 Now I need to make her little hat and carve the faux pumpkin head. She took much longer than I expected, but I wanted to get her just right. I am having way too much FUN!!! I hope I can have her all done this weekend. Working on some sparkly things this week. I got this great graphic from The Graphics Fairy!! She has something wonderful everyday!! These cones are deceiving, they are pretty tiny, only about 4 inches tall. This is a tiny party hat!! 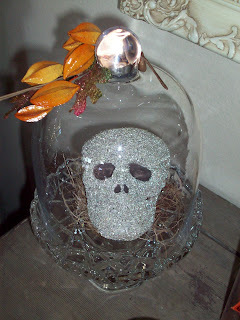 I saw some glittered skulls at Pottery Barn the other day, so I thought I should try some. I like the way they turned out. 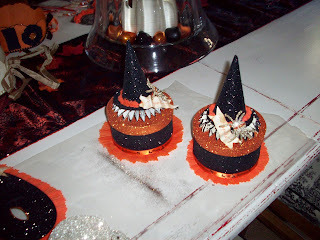 Spooky and sparkly!! Hope I can visit you all soon. 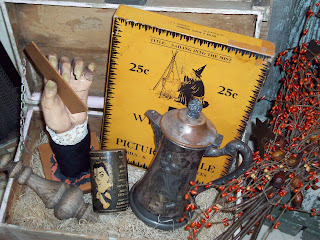 Today, Cielo of The House In The Roses is hosting your favorite window day!! 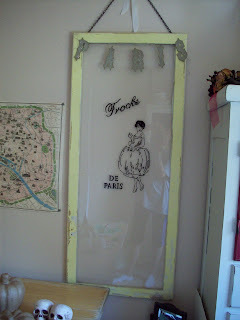 http://houseinroses.blogspot.com/ If you want to see some great windows, be sure to visit her blog today. This is a view of my kitchen window. 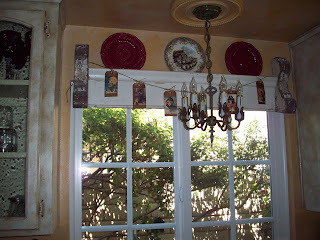 It's my favorite, because of the valance that my husband made out of an old piece of molding from the Ventura flea market. 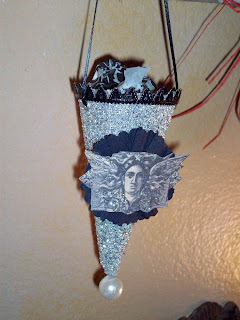 I also love my small chandelier from the Rose Bowl flea market, and the corbels from the Santa Monica flea market. 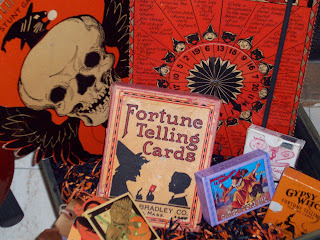 It's a combo flea market extravaganza! 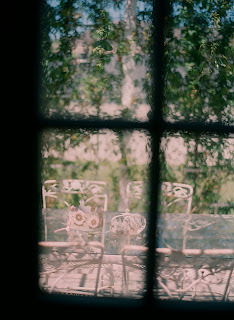 My second new favorite window is this photo, taken by a new friend of mine, Elizabeth Messina. She is a wonderful, amazing photographer. We met in Garden Memories, the shop which carries some of my artwork. Elizabeth was in the shop purchasing some items for her daughter's birthday. She happened to be picking out some of my crowns when I was in the shop dropping more items off. 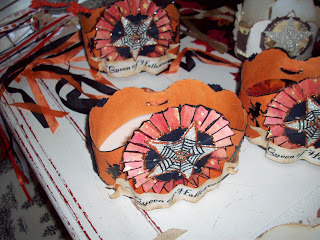 She took some beautiful photographs of the crowns, and was kind enough to give me some copies. 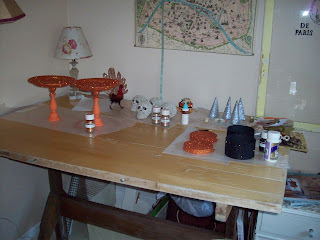 http://www.elizabethmessina.com/ Here you can see the crowns from her window. 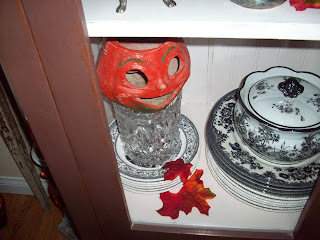 I hope you enjoy visiting favorite window day! I was also recently tagged by my nice blog friend Amy, for 7 random things about me. Now, I have done some of these lists before, so I had to come up with more random stuff. 2) I never drink a glass of milk. I use it in coffee, tea and cereal, but never drink it by the glass. 3) I like Christmas Eve better than Christmas Day. 6) I believe in ghosts, even though I have never seen one. 7) I have to make the bed as soon as I get up. Now I am suppose to tag 7 more of you. 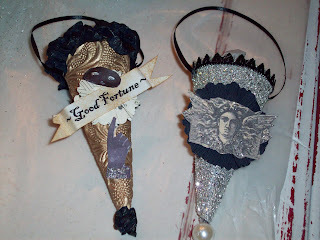 If you ever read Rebecca Ramsey's blog, Wonders Never Cease, you know that everyday she has a new wonder of the world!! 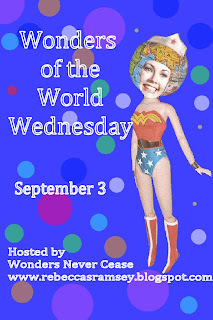 Today is Wonders of the World Wednesday, hosted by Rebecca. 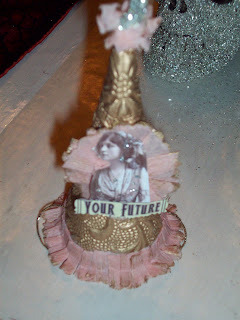 http://rebeccasramsey.blogspot.com/ Please visit her blog, she is a fabulous writer!! 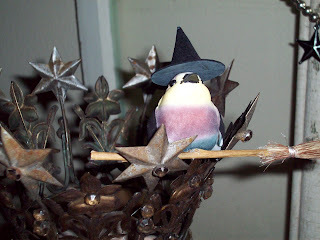 My wonder of the World today is Halloween. Surprised aren't you? 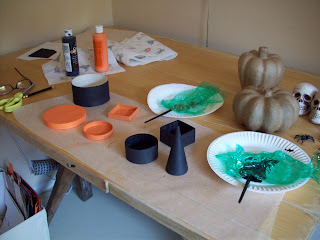 Since I have been making a lot of Halloween related art lately, I thought you might like to see what I have been doing the last couple of days. 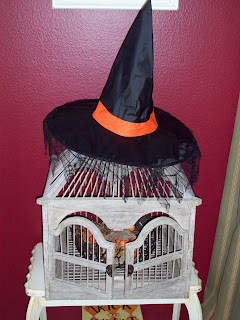 Decorating my house for the season. 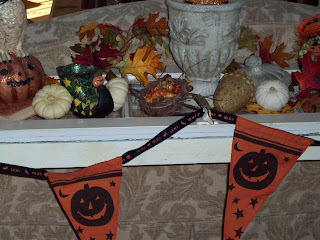 I have so many decorations, I start early, so that I may enjoy my decorations for awhile. 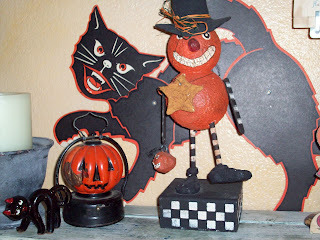 I have been collecting vintage Halloween decorations since the early 90's. 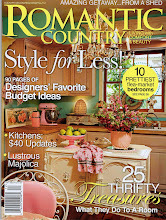 An article in the Oct. 1992 issue of Country Living started it all. I like to mix the old with the new. 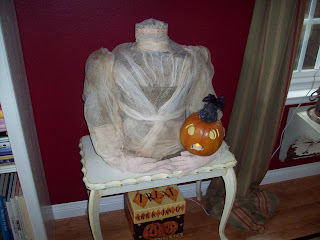 I tend to do that with all of my decorating. 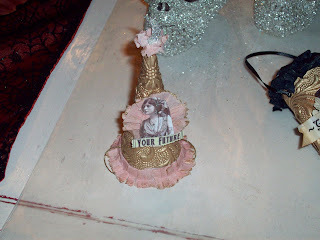 Vintage is a big influence in my artwork too!! My pieces tend to look very vintage. 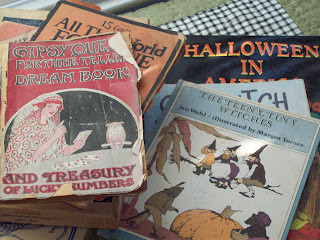 I think it's a wonder that some of these old books, and decorations have survived over the years. 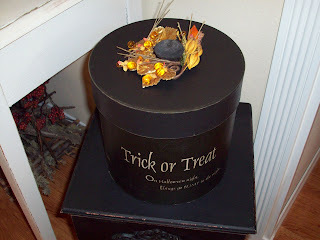 I hope you enjoy the Pre Halloween wonders!! 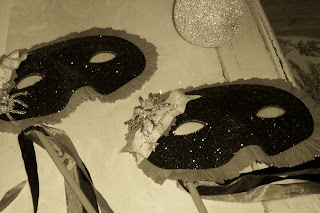 These are a fraction of my decorations. I'm sure I will post more as the holiday gets closer. 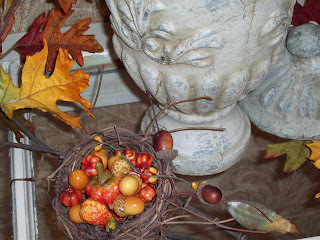 Have a wonderful day, and visit Rebecca's blog!